A little water never hurt anyone, right? The truth is that water, though we swim in it, play in it and consume it on a daily basis, can be harmful or even deadly in the wrong scenario. Wet feet can cause illness, initiate frostbite and even lead to the loss of limbs. For outdoorsmen and those who ski or hike snowy trails, a good pair of waterproof socks can mean the difference between the joy of your favorite activity or a tragedy that ends with amputation. While your reasons for purchasing a solid pair of waterproof socks may not be quite as dire, you want a sock that’s going to keep water and cold out while still allowing your feet to breathe. Here’s how to select a pair, how to use them, how to clean them and what to look for. While socks that seal out water ARE used for higher-stakes expeditions and multi-week hiking trips, it’s more likely that you’re shopping around for purposes like fishing, cold mountain climbing or any other type of cold outdoor activities. However, if the goal was just to keep moisture out, then waterproof socks would be made out of plastic or some other type of non-breathable material. Naturally, a sock made out of such a medium would completely suffocate your foot. By not allowing the skin to breathe or cool, the foot would heat up, producing perspiration and soaking the inside of the sock. If the inside of your sock is soaked from your own sweat, there’s not much sense in outside that’s waterproof. With this in mind, most waterproof socks are designed using a three-layer approach, which contains a quick-drying, outer shell, a layer that wicks away moisture and an insulated interior that keeps your feet warm and toasty. From hiking and fishing to boating and backpacking, the uses for waterproof socks are nearly endless. Cross country users love them for plowing through puddles, skiers use them to keep their feet warm and dry for full-day skiing excursions and snorkelers use them in conjunction with wetsuits to stay warm underwater. Pretty much any outdoor sport where you can conceivably encounter moisture can be made more comfortable with the use of waterproof socks. Waterproof socks are designed in a wide array of fashions and styles, but they all have one thing in common – each aims to keep your feet warm by keeping water out. When toes are one of the body parts that most commonly fall victim to frostbite, it’s worth the money to invest in heat retention. The warmth that waterproof socks seals into your shoe may also allow you to participate in the sports and outdoor activities you love in a season you otherwise might not have been able to. With their added padding, extra warmth and high-quality material, the waterproof socks on the market today might feel more like slippers for men than the multi-use, tactical field gear that they are. Don’t let them fool you! They prove that comfort and utility can coexist. Besides adding comfort through warmth, they also relieve friction-related sores like blisters which are commonly caused by damp socks. Whether you’re skiing the slopes of the Swiss Alps, hiking the Appalachian Trail, running a marathon in the snow or doing something a little less impressive, waterproof socks are going to increase your performance. The added grip allows your feet to grip to the bottom of the show, which makes it easier to walk, run, hike or bike without slipping or falling, even in streams or mud. Additionally, some brands have even incorporated grip technology to the bottom of the sock, to increase performance even more. The advertising on the package may say the product is 100% waterproof, but the sad truth is that the advertising is a bit of a stretch. For any sock to be 100% waterproof, it would have to be constructed out of rubber or some other completely unbreathable material. The good news is that waterproof socks are constructed and designed so well, that you probably won’t notice this if you’re using them appropriately. Few socks can truly protect your foot from full immersion at extended periods of time but don’t worry, most people don’t need that, anyway, so a good pair of water-resistant socks will do the trick. For the most part, waterproof socks are intended to be worn like any traditional sock but may take a little extra effort to put on or take off. While some may choose to wear their waterproof socks directly over their feet, some are large enough to accommodate a pair of regular socks for men underneath for added cushion and comfort. The thicker, waterproof material these socks are made out of can sometimes take a little more time and care to slip onto your feet. Don’t rush to get them on your feet and risk damage or tearing, simply take your time. Some products have ankle straps for added security. If you’ve purchased a pair with this feature, wait until you had the sock fully on and adjusted before you fasten the strap. When you strap the socks on, do so firmly enough that water will not seep in, but loose enough to allow adequate circulation. Once your socks have been exposed to water, you may find it even more difficult to remove them. As with putting them on, simply remember to remove them with patience and care. As soon as you remove your socks, you’ll want to wash them and allow them to dry. This helps keep them in good shape and assures that you’re not allowing for the growth of mold or mildew. It makes sense to wonder if a sock made out of a waterproof material would be sweaty and uncomfortable. After all, the same technology that would keep water locked out of a sock would at first appear to cause any perspiration to stay locked in. However, the unique materials these products are constructed out of allows them to wick away moisture without trapping perspiration. Here are a couple of the most common materials used in waterproof socks. Often, they are used in conjunction with each other in the form of blended fabrics for optimum efficiency. 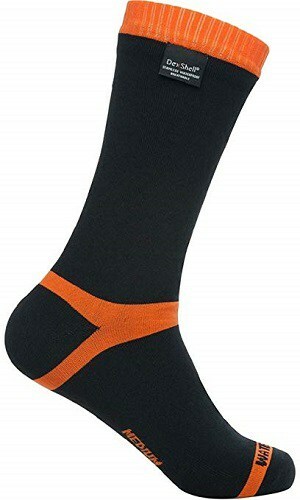 You can say that all waterproof socks types are tightly connected with the material from which they are made. Merino wool is impressive for its ability to hold in heat. Its unique properties react to skin temperature, which helps them stay efficient for long periods of time. Especially ideal for those who wear hiking boots for long, snowy treks, socks made out of merino wool are sure to keep your toes toasty. Nylon-based waterproof socks tend to breathe more freely than wool or other options. Often combined with polyester and spandex, nylon products usually also have the added advantage of being smooth and comfortable to the touch. Options crafted out of bamboo rayon have a silk-like texture that prioritizes comfort. These socks are also generally easier to remove, while some of their heavier, thicker competitors can tug uncomfortably at the skin. Neoprene is a popular material for surfing and scuba-diving wetsuits. Though neoprene products may be marketed as waterproof, they actually don’t stop water from coming in at all. Instead, neoprene is designed to utilize and embrace it to maximize warmth. By absorbing a small amount of water into the material, neoprene-designed socks use your body to heat the water held in the fabric and use it as a barrier against the cold. The upside of these products is that they’re usually durable and are still effective even when submerged completely. Gore-Tex is a patented fabric brand that is used often in outdoor and watersport clothing. Its technology makes it both windproof and breathable. The downside is that it’s not very flexible, which makes it extremely hard to put on. It is, however, great at keeping your skin as dry as the Sahara when matched up against creeks, mud and rain. Waterproof socks aren’t one-size-fits-all. These products are designed with vastly different needs and activities in mind, so selecting a pair that suits you takes some consideration. Do you need a sock that’s going to withstand abuse, drastic temperatures and harsh weather or do you just need a product that will sufficiently wick away moisture? Socks come in varying levels of quality and the absolute truth of the matter is that not everyone needs to invest in a top-of-the-line product. Assess your needs and select a sock that suits it. Especially if you want to wear your socks in both warm and cold weather, you probably want a product with maximum breathability. After all, what’s the point in a waterproof sock that has your foot drowning from the inside due to your own sweat? Look for socks that have porous, flexible material which will allow your skin to breathe. Especially important for those who are purchasing waterproof socks for skiing, winter hiking or any other outdoor sport which occurs in cold weather, warmth is going to be a deciding factor. For socks with the highest heat retention, look into wool-based products. If it doesn’t fit, it’s no good. Unfortunately, there’s less size variation with waterproof socks. Waterproof materials also tend to be a little more unforgiving than traditional socks when it comes to fits and sizes. Socks that are too big or too small will be useless at keeping water out. For that reason, it takes a little bit more care and attention to get a pair that truly fits. Just to be sure, always consult the company’s guide to sizing when making a purchase. Thickness is a big varying factor when it comes to waterproof socks. Although denser materials are more comfortable for long hikes and hard terrain, they’re also heavier and may be uncomfortable in some scenarios. For example, a cross country runner wishing to sport waterproof socks for a rainy marathon run might invest in a lighter, thinner option. Thinner socks are also great because they can double as regular socks on laundry day and even be worn with regular shoes, such as your trusty tennis shoes or a pair of the best chukka boots. The ideal sock will have a comfortable fit that is snug without being too tight. You want the sock material to firmly hug your skin and ankle and guard your foot against seepage. However, you also want to have full circulation and comfortability. Practical and creatively designed, RANDY SUN Socks are the best you need to provide your feet with daily care and comfort. They’re ideal for various outdoor activities, sports or extreme cold. 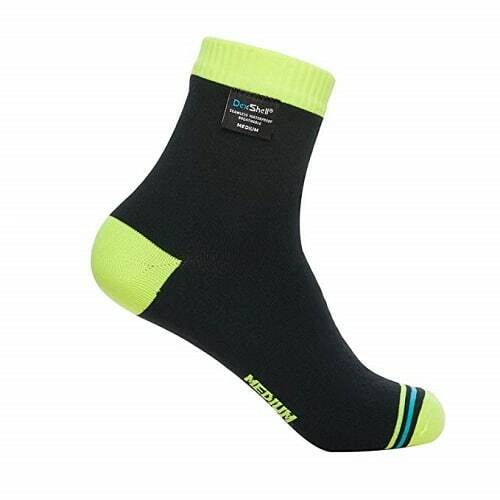 The formation of these socks includes a high-quality lightweight, waterproof and breathable lining membrane that helps keep your feet warm when you’re biking or running when it’s raining outside. Most users love them because they prevent water from reaching the feet in a fantastic manner. They have antibacterial functions and can absorb moisture and sweat to keep your feet nicely dry and prevent bad odor. You can wear them on warmer seasons without worrying about smelly feet. This product is also designed with different colors and sizes you can choose from. It’s also very easy to clean them. All you need is to wash them under normal temperatures not exceeding 40-degree centigrade, then dry spin and finally hang to dry in an open ventilated area. Designed with high-quality fabric, Weatherproof Premium Socks are well set to wick sweat away from your feet and provide them with amazing comfort. What most men like about these socks is that they are all-purpose. They can be worn in any condition because of their full-cushion footbed design that aids in temperature balance. 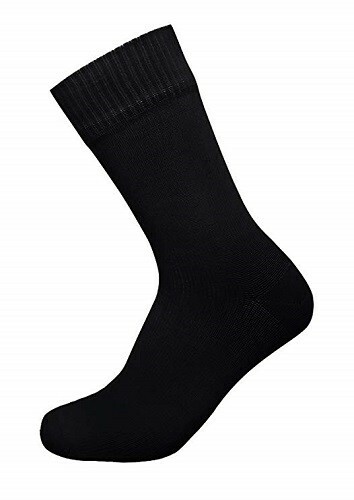 Put together by quality fabrics including cotton, acrylics, wool, rubber and spandex, these socks can keep your feet incredibly warm in any weather. The efficient temperature regulation further helps keep you warm when it’s cold and cool in warmer conditions. They are also designed with amazing arch support which makes them very easy to use and ideal in easing inner sole pain caused by prolonged periods of standing and walking. 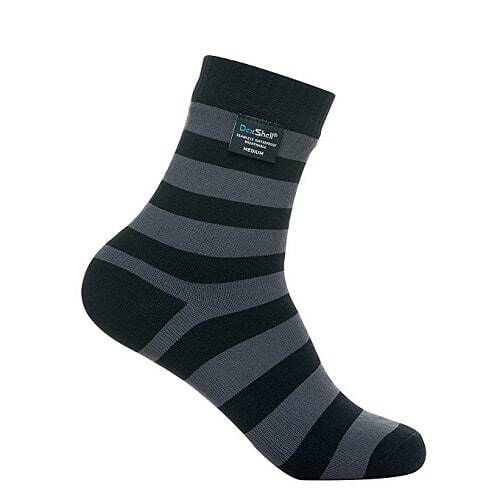 Designed with 80% of cotton, DexShell Waterproof Socks are very comfortable to wear for hiking, running or biking. Unlike other brands, these socks will cushion your feet and prevent blisters. The inclusion of 96% nylon fiber in the design helps keep your feet nicely warm and dry. It’s also created with neoprene, placed in the inner lining to prevent water from reaching your feet. 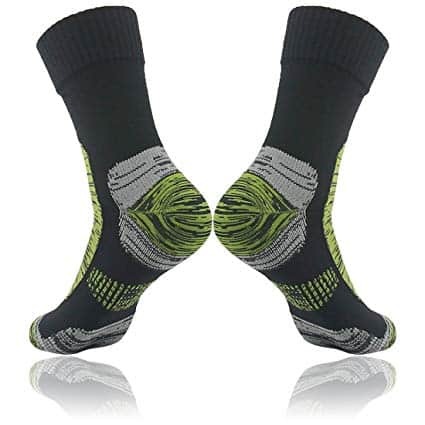 These socks are incredibly light and their waterproof capability enhances comfort as you hike, walk with your dog or wade through water during a fishing activity. They are made in various sizes and colors and tend to last long, even after several washes, because of their three inner layers. Perfectly created with great fabrics, Always Outside Socks are windproof, waterproof and with incredible breathable capabilities to help your feet stay toasty and warm in either dry or wet weather. You don’t have to worry about stuffiness and smelly feet because these socks are constructed with one of the best sweat and moisture absorbing functions to help enhance comfort in every step. Carefully designed for active wear, they are flexible and abrasion resistant which makes them ideal for most outdoor activities such as sprinting and biking. Furthermore, you can wear them with your favorite boots and sneakers for a more comfortable walking experience. 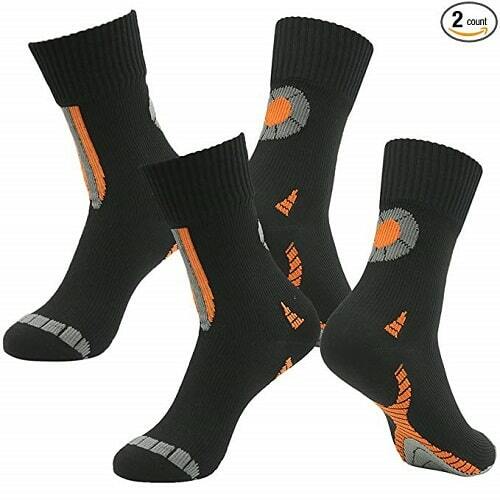 Most users who love fishing any activity that involves wading in water find these socks very useful because of their inner layer waterproof abilities. Created with high performing waterproof, windproof and breathable technology, SEALSKINZ Socks are ready to protect your feet and keep them comfortable wherever you go. They’re designed with three layers which makes them extremely waterproof, breathable and windproof. Because of this, you can heavily rely on them to perform excellently in numerous outdoor activities. 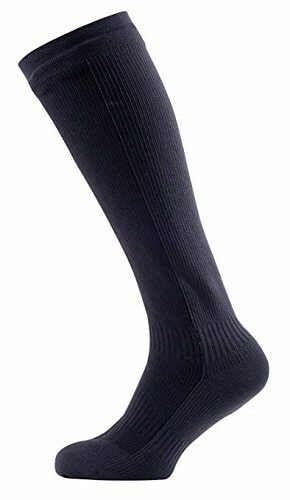 Designed with high-quality merino wool lining, this sock has a perfect moisture control and improved breathability that prevents bad odor and keeps you feeling warm and comfortable. What separates it from other socks is that it has been designed to last for long. It’s made with a great padded heel, toe and footbed which results in a flat seam that prevents rubbing, hence increasing durability. Formed with strong materials, including high-quality merino wool and nylon, WATERFLY Socks are simply the best. Most users love them for being extremely waterproof and breathable. They are designed with 98% nylon and 2% rubber. This ensures that no water reaches your feet while walking or running. You can comfortably wear them for most of the outdoor activities because they are designed to endure the harsh environment. The breathable nylon creates a very comfortable mesh that enables the control of moisture and spreading of sweat to leave your feet dry and feeling amazingly fresh. These socks are also known to last for long because of their three layers design. Furthermore, they are elastic which makes them easy to use by men who have both larger and smaller feet. Carefully created with Porelle membrane, DexShellUltralite Bamboo Socks perform extremely well in preventing water from reaching your feet and wicking sweat away to leave your feet dry. They have a simple casual design with an ultralightweight and soft inner bamboo lining that ensures your feet are warm, especially in wet conditions. Also, they’re able to prevent your feet from catching a bad odor caused by stuffiness. The Porelle membrane is breathable, controls moisture and absorbs sweat to help you avoid getting embracing smelly feet whenever you take off your shoes. It has a seamless construction which helps prevent blister problems. Another great thing about these socks is that they’re versatile and can be worn during numerous outdoor activities. 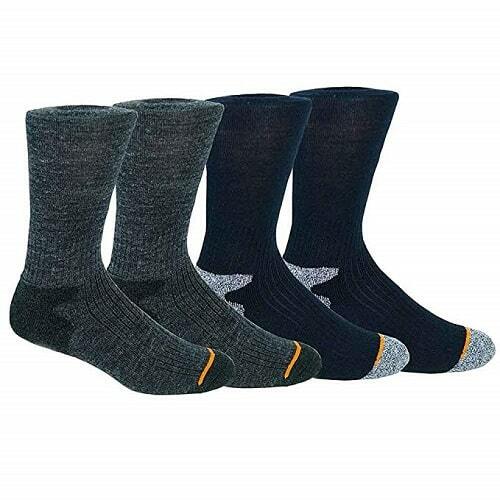 With a three-layer knitted design, SGS Certified RANDY SUNSocks will give your feet the fantastic comfort they need during your daily activities. Nothing prevents external water molecules from reaching your feet better than 100% waterproof fabric used in crafting this item. This fabric excellently blocks water to keep your feet warm and dry and also helps get rid of sweat and bad odor. 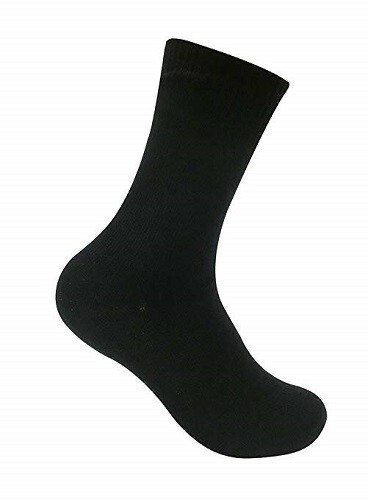 Lined with quality inner layer fabric with greatly performing breathing properties that regulate moisture and perspiration, this product is quick in absorbing and spreading sweat outside the sock to give a fresh feeling to the feet. It has also been designed to resist harsh environments and for use in various outdoor occasions such as cycling, skiing and climbing. You get to choose from multiple colors and sizes. 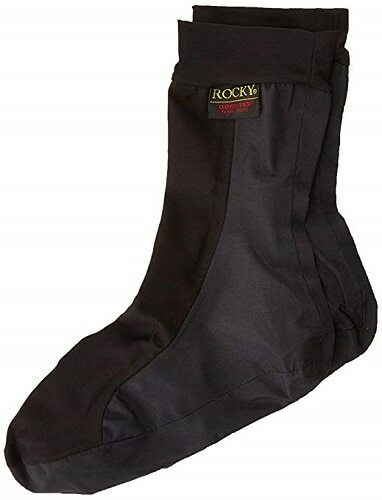 Practical and well designed, Rocky Waterproof Socks are the best option you can get to keep your feet dry for long hours even in terrible, wet weather conditions. This model is also known to prevent feet from getting frostbite in the desert. With a breathable construction, they help properly regulate moisture and sweat. The layers are perfectly designed to absorb sweat fast in order to leave your feet feeling comfortably fresh. If you like riding a motorcycle, these socks are ideal for you. Their 11 inches in height with a tight top help in keeping water out even where your boots are not waterproof enough. The external layer is designed to give more abrasion resistance. 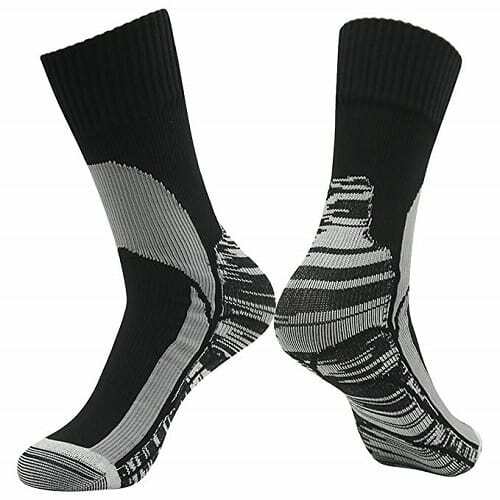 You can, therefore, walk in all kinds of terrain with these socks without experiencing blisters problems. Carefully designed with quality fabric layers, this model of RANDY SUN Socks is superior in preventing wind and water from penetrating and reaching your feet, due to its 74% nylon formation. They’re also formed with ultralight cushion functions which are enabled by the 64% Coolmax lining to provide comfort by keeping your feet dry and cool as you walk or run in warm weather. The excellent wind and waterproof abilities also make them ideal on cold occasions such as snow sports and mountain climbing. They’re amazingly designed to help keep your feet dry and free from disagreeable odors. The breathable, moisture and sweat-wicking properties are ideal in giving your feet a fresh feeling all day long. Furthermore, this product has reinforcement on the toes and the heel assures to enhance feet comfort. Cleaning is effortless and the colors hardly fade even after several washing occasions. If you’re using a machine to wash them, you only need to ensure that the temperatures aren’t beyond 40 degrees. Designed with high-quality nylon and merino wool, Dexshell Hytherm Pro Socks can react to your body temperature to keep your feet feeling refreshed. The mid-calf length and porelle membrane lining are properly placed to prevent water from seeping through the sock. When walking in wet conditions, the merino wool is designed to help in releasing body moisture and temperature to keep your feet warm. Seamless construction is comprised of a nicely fitting footbed which is meant to enhance comfort to your feet throughout the day. It’s also easy to care and clean them and you can decide between a machine or hand wash. The temperatures should be maintained below 40 degrees in case of a machine wash, before hanging the sock in an open and well-ventilated area to dry. Without the proper maintenance, socks can lose their effectiveness or even cease to be waterproof at all. After purchasing your perfect socks, you need to be sure to take proper care of it. 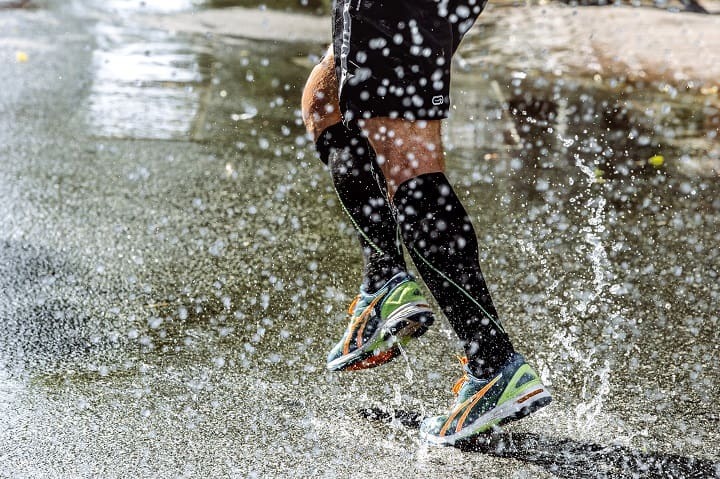 These guidelines will help ensure that your waterproof socks last. Some products are machine washable. However, the technology of many waterproof sock designs can’t stand up to the heat and cycle of the standard washing machine. Always consult the label of your socks as to whether or not they can be machine washed, but a good rule of thumb is to wash them by hand using a gentle detergent. 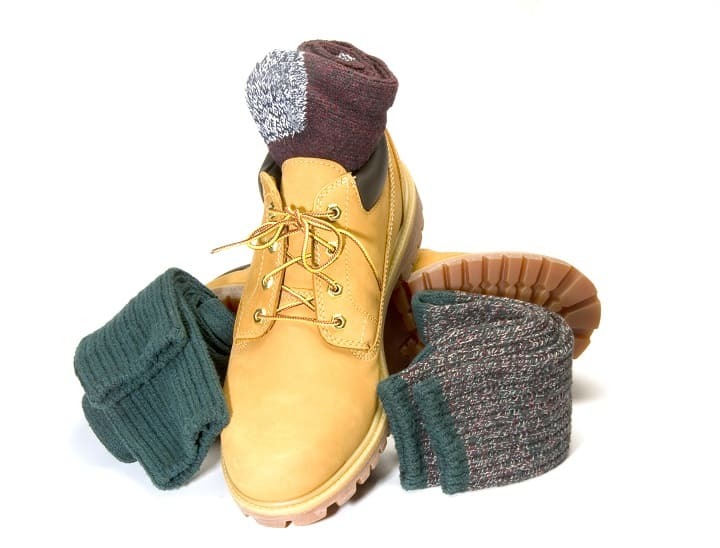 Many waterproof socks (such as all wool socks) require air drying rather than machine drying. Again, the delicate structure of the waterproof material will be made ineffective by the harsh conditions of a dryer. Air drying takes time and can be a pain, but its worth it, in the long run, to keep your socks in good shape. You’ve probably loved puddle-stomping since you were a kid. Whether you’re fishing, hiking or doing anything else outdoors, knowing that your feet are protected from the elements is an unusually wild feeling of empowerment. You can walk through a stream without worry, stomp through puddles without care and trudge through snow and not think twice. Along with other gear like a good tactical jacket, a professional boot knife and heavy-duty gloves, you can be ready for anything. When you’ve clad yourself in a high-quality pair of waterproof socks, you’re one step closer to being invincible and nothing feels better than that. Photos from: chelsdo / depositphotos.com, Ruslan / depositphotos.com, rjlerich / depositphotos.com, fineart / depositphotos.com and derepente / depositphotos.com.